Who better to help launch our new brand than our very own tenants! Introducing the Moulsecomb-residing faces of Coapt; Emily, Maisie, Ellie and Harry. 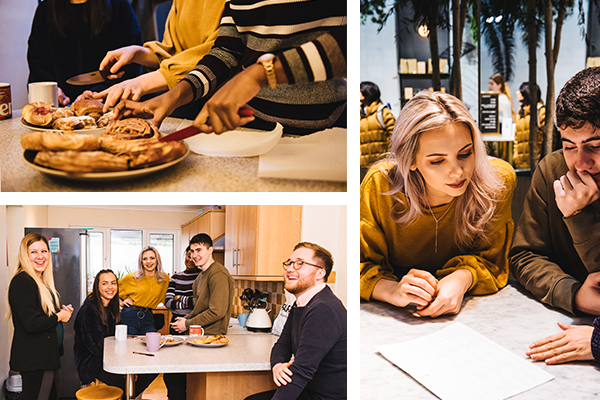 After much internal office debate discussing who we thought our most diligent and friendly tenants were (we have a lot to choose from, but these guys keep their house in a permanently Instagrammable state), we got in touch with Emily – the hostess of the house – to surprise her and her housemates out on an all-expenses-paid adventure in Brighton and to become the faces of our new brand. 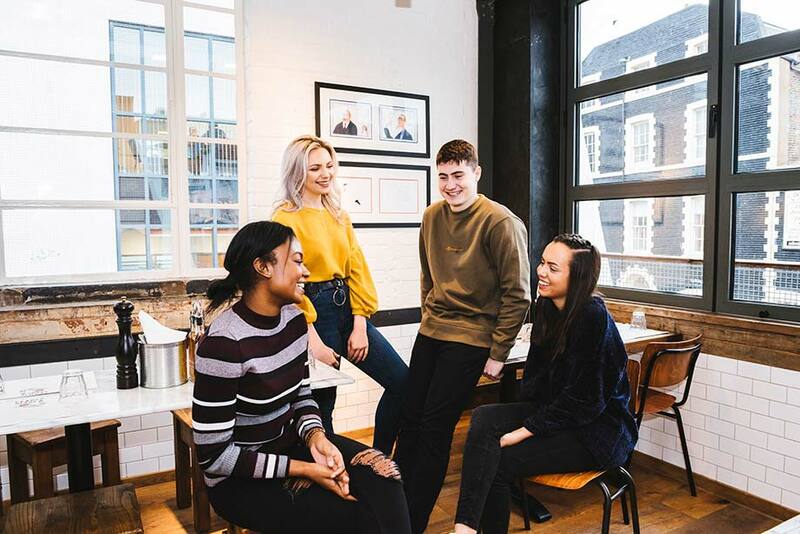 In the spirit of building a sense of belonging in Brighton, and sharing our love of the city, we picked a programme for the day that would introduce the students to places they hadn’t explored before. So after starting at the house with an array of delicious pastries from Real Pâtisserie we headed on down to St James’ street to grab a coffee from the delectable Red Roaster. 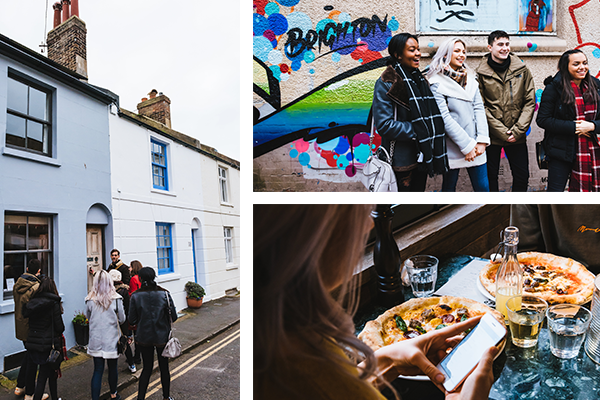 Buzzing from the coffee, we headed out to meet Dr Bramwell – author of The Cheeky Guides – for a walking tour of Brighton’s back passages. If you’re brand new to the city and really want to get a sense of the creativity, the history and the downright absurd, the Cheeky Guides definitely help you discover it! We wandered through the alleyways behind St James’ street, revealing hanging teacups and the marvellous Little Fridge Library (definitely a hidden treasure). The tour then took us through the South Lanes, now home to a myriad of jewellers; through the independent retailer streets in the North Laine, and finally to a surprise visit to local artist Chris Macdonald’s home! Now that was awesome. After walking round most of the city centre we really needed to stop off for some lunch, so it was off to experience Brighton’s latest food craze – artisan pizza – at Franco Manca. For future reference: the chilli oil is hot, don’t just slap it all over your pizza like you would do at Pizza Express… It’s not the same ???. Despite our full bellies, post-lunch was time to head down to the seafront to enjoy the beautiful clear skies and views out to the Rampion Wind Farm. 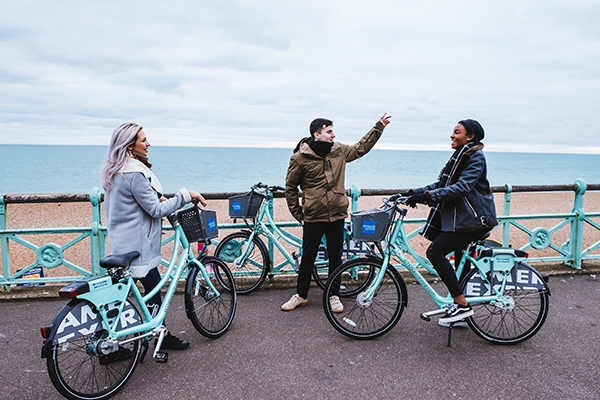 The kind folks over at Life Bikes lent us some of their wonderful bikes – which were surprisingly comfy and easy to ride – so we whizzed down to the Pier and along to Hove Lawns. Luckily you can park these bikes anywhere (in zone) that it would be legal to park your normal bike as one of the docking stations nearby was full. Shortly after, the winter sun quickly descended and all the twinkly lights of Christmas burst into life along the seafront and acted as a beacon to guide our way to The Tempest Inn for hot chocolates. Delicious!